Last week, Two weeks ago, I gave you all free range to ask The Pilot questions about what it's like to take to the skies on a regular basis for work. Some great questions came out and The Pilot is here to answer them! So without further ado, here he is! Kelly asked "What do you do to keep your calm when something unexpected happens on a flight?" "Scream over the intercom that we're all going to die. No, but seriously, everything is training based. If you're trained properly enough, you're trained for the unexpected so if something unexpected happens, you just take a breath and trust your training and deal with the issue." Cait wants to know where your favorite place is that you've flown to. "Well my favorite airport to fly into is Washington Reagan International and that's mostly because of the awesome river visual approach that, coming in at night time or even during the day, you get to see the White House. It's a very challenging approach so it makes it fun flying when everything else is so similar, so it's fun. My other favorite place to have a layover or an overnight is Canada. I really like Ottawa, Toronto and Quebec City, those are probably my top 3 favorites. The people are very friendly, they're very pretty cities." Holly asked why you wanted to become a pilot and what you love most about it now that you are. "Top Gun. Nah, I'm just kidding. From a young age, you know, my first trip on an airplane, going to an airport when I was young, just getting on a plane, the whole experience was a blast. It was something I really liked, looking up at the sky; playing baseball as a kid, you're always looking up to the sky and seeing all these planes flying overhead, it's just...the thrill of flying is something I've always had, something I always thought I'd be good at. Now that I am a pilot, every day is different. It's never the same, but it is what I thought it would be and to train so hard for so long and finally being here just makes it...achieving your goal is just so great." "No. Never. I'm never nervous, when Christy's with me it's more exciting, I want to try to have a good landing and just be very smooth, but that's the way I fly anyway, so it doesn't matter whether she's in the plane or not, it's just the way I fly. I want to make it comfortable for the passengers, so if that's the way I fly, there's nothing to worry about." Meghan asked how you stay awake/alert on flights and if you get nervous in bad weather? "Well, since I don't drink coffee and I'm not a coffee drinker, I tend to drink a lot of caffeine soda. That tends to be my way of staying up or alert. But a lot of times, just being able to talk to the other pilot about life or just the day in general, just kind of keeps you up." "Once again, it's not nerves, it's excitement. Bad weather...all it is is really just another challenge that gets you up. Like I said, you train so hard that, going through bad weather is nothing, it's just another daily routine. But there's no other experience like popping out of the clouds at 300 feet and seeing a runway in your face, it brings on the excitement so I'm never nervous about it. RoseAnn wants to know you handle turbulence and if it ever freaks you out? 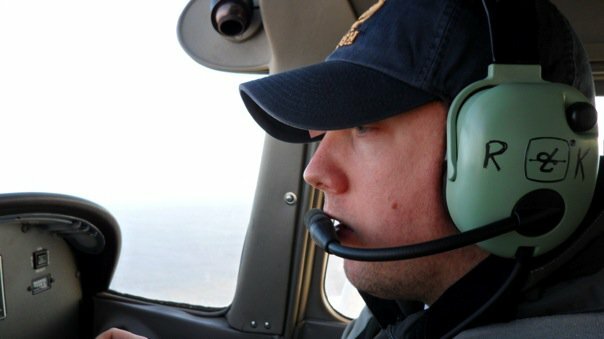 "My very first flight ever, I was up with an instructor and we had just taken off and we hit a little bit of turbulence and I looked over at my instructor real quick and he was cool and calm as a clam, like nothing ever happened and I think from that moment on, I was very calm with turbulence. It's just a nuisance more than anything. It's just annoying. It's like driving in a car down a bumpy road, you do it, it's annoying." "Yes. It may not necessarily be for the instruments themselves, like they say, but it is a FAA regulation and not complying with that could be a felony, technically, but with the effects of instruments, my experience is that, when people do have their cell phones on and have service, it does create a static noise in my headset when I'm trying to communicate with ground control. That's my experience with it. Do I know if it necessarily affects other instruments? I don't know for sure, but it is annoying to hear some rattling going on in your headset because someone left their cell phone on." Thanks for answering everyone's questions! How do you feel about flying? Are you a nervous flier or do you get excited about boarding a plane? Have you ever met a pilot? If you have any other questions, feel free to leave them in the comments! aw this is so great girl :) i loved that he answered all the questions! Im actually not a nervous flyer but i hate turbulence ha! These are some really great questions!